You start your journey as a 10 year old boy who travels through the region of Sinnoh just like a platinum demake. However quickly after a few gyms a few hackers are introduced and the have some ASMagix skills to alter the timeline of Sinnoh. Stavros is portrayed as the villian, whilst Roddles is a junior hacker learning from Stavros but has a softer heart. Barry does not like Stavros and seeks out to stop him, only landing him in more trouble. You play the role of becoming champion of Sinnoh and restoring balance to the region whilst keeping Barry in line. 649 Pokemon – This includes forms!! Make sure you collect them because there will be sidequests where different forms of Pokemon are needed!! Multiple Regions – As if Sinnoh isn’t big enough? Not to mention that there will be hidden areas never before seen in Sinnoh you get to travel to different regions like Unova! Time Travel – Travel through time and be careful not to alter the future! Many Pokemon will appear in different regions, trainers will have different Pokemon. Don’t expect map changes… Geological processes take hundreds of thousands of years and you don’t travel that far XD! New Evolutions – OK, trading Pokemon in a hack just isn’t practical so here are the fast and easy ways to evolve your Pokemon. Let’s not forget that new evolutions like male and female (Burmy and Combee) exist so grab your gender specific Pokemon! 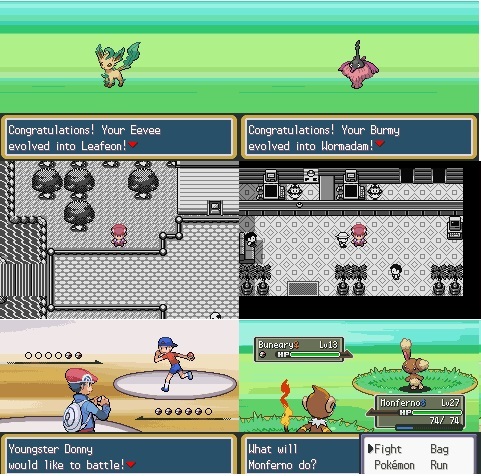 EV’s – Yes Trainers now have EV’s which is introduced post generation 3 games. So when you are up against level 95 + Trainers and you trained your one Pokemon your going to have a bad time. In fact some ‘hacked trainers’ may have more EV’s than allowed. Shame on you Stavros! Non-Platinum Storyline – OK, a demake might be kind of boring especially when there are much better ones on the community. But when you have extra hidden areas and side quests you sort of need more flavour to your dish! New Pokeballs – The Gen IV balls are in as well as the Gen II balls. You also have plenty of space in your bag. More TM/HM’s – There are now 95 TM’s in the game. The first 92 are Platinum Standard, followed by Wild Charge, Whirlpool and Dive. Yes you will explore the depths of Sinnoh. New Moves and Move Effects – Most new moves have been implemented which correspond to the Gen IV move lists. New Music – Platinum styled music as well as themes from many other games like Donkey Kong. Many more features to explore and find yourself! !